Prominent & Leading Wholesaler from Ahmedabad, we offer high pressure ultrasonic homogenizer and colloid mill. Our high pressure homogenizer contains an Orifice that accelerates fluids in excess of 300 ft/sec at back pressures to 5,000 psi. An ultrasonic cavitational field forms around a knife-like Blade set within the fluid path. 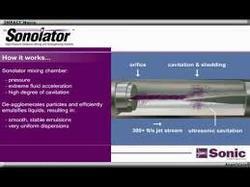 This controlled turbulent flow creates very fine emulsions and suspensions with sub-micron droplet or solid particle sizes. By itself, the Sonolator Homogenizer is actually quite small with no moving parts, but coupled to a PD Pump it makes a powerful homogenizer mixer system. Sonic Corp has vast technical experience working with process PD pumps, process instrumentation, engineered components, motors, PLC, VFDs and process automation. This allows us the ability to design and fabricate intricate mixer homogenizing systems that improve your factory output while reducing energy and waste. We’ve coupled this expertise with outstanding 3D design and engineering via AutoCAD to provide a trustworthy and reliable design for your mixing and processing applications! Sonic Corp shines in the fabrication of customized homogenizing skids because we pay attention to every manufacturing detail to make a beautiful system that functions superbly. Colloid Mills are your best answer for particle deagglomeration and primary particle size reduction. Sonic’s Roto-Mill rotors and stators are designed with a patented and proven multi-angular system to provide superior shearing and grinding. There are 3 shear points that subject material to a higher degree of grinding than conventional mills. Undispersed material is forced into a cavity formed by a spinning Rotor and fixed Stator; centrifugal force propels the material to the outside of the Rotor, causing intense hydraulic shear that breaks agglomerates and homogenizes the solids and liquids. - Stone Rotors and Stators from 36 to 120 Grit for Tough Applications. - 316 Stainless Smooth and serrated Rotors and Stators. 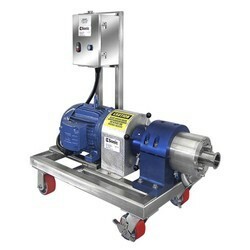 - Feeding Pumping systems supplied with Waukesha and other style pumps.